Torre del Mar Cala Tarida, Hotel Spain. Limited Time Offer! Hotel Torre Del Mar. 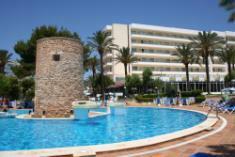 The 4-star "Hotel Torre Del Mar" is a convenient base point from which to explore Playa d'en Bossa. Breathe in some fresh air overlooking the coast, located close to the residence. There is a total of 220 rooms to choose from. Hot weather is kept outside thanks to the relieving air conditioning. Begin your day taking a little walk in the private garden. The accommodation offers its visitors the luxury of a covered and open-air swimming pool which are also fit for children. Mini-golf, fishing and parachuting are some of the recreational activities the hotel offers. For visitors who like participating in some sports, this hotel also offers various options, like waterskiing, yoga, diving, table tennis, squash, sailing, aerobics, pilates, volleyball, horse riding, pool and tennis. Furthermore, there is a gymnasium, a tennis court, a pool table and a water park as well as a bike rental service. After all your day's activities, the onsite spa is the ideal place to recover your strength. Go bathing in the whirlpool bath or Turkish bath and give your health a boost with the sauna. You have the opportunity to offer yourself, for instance, a relaxing massage treatment. Guests can have dinner at the onsite restaurant which proudly serves its regional and international specialties. A lounge bar is available for you to enjoy a drink after dinner. To add to your stay, breakfast is included. Guests can go online at no extra charge. Of a Luxury category, the Sirenis Hotel Goleta and Spa has all the comforts such as : Bar, Front Desk 24hr, Business Center, Laundry services, Television, Satellite Television.It is situated at Apdo.